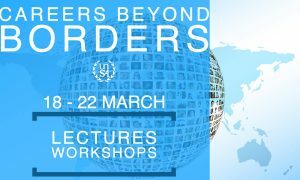 Careers Beyond Borders (CBB) is an international career event that provides you with the opportunity to meet professionals in the field of international affairs. Every year, it welcomes professionals in international organisations who talk about their daily work, past experiences and career paths. This is also an excellent chance to get personal tips on how to land your dream internship and kick-start your international career. We have 6 lectures and 4 workshops in store for you, all aiming at providing you with experiences and skills you can profit from for the rest of your life! Throughout the lectures, students will have the chance to get career advises from professionals from politics and diplomacy, the European Union, NGOs, think tank organisation as well as start-up. The workshops are intended to improve the personal development of the students registered for one of our lectures and educate them to become prepared for working life. The workshops consist of Goal Setting Training, Time Management Training, Extreme Ownership Training, and CV Training, all provided by AIESEC, a global leadership development organisation. The lectures will cover diverse topics from very diverse speakers of backgrounds ranging from diplomacy, to NGOs, sustainable start-ups, think-tanks, EU Permanent Representations.